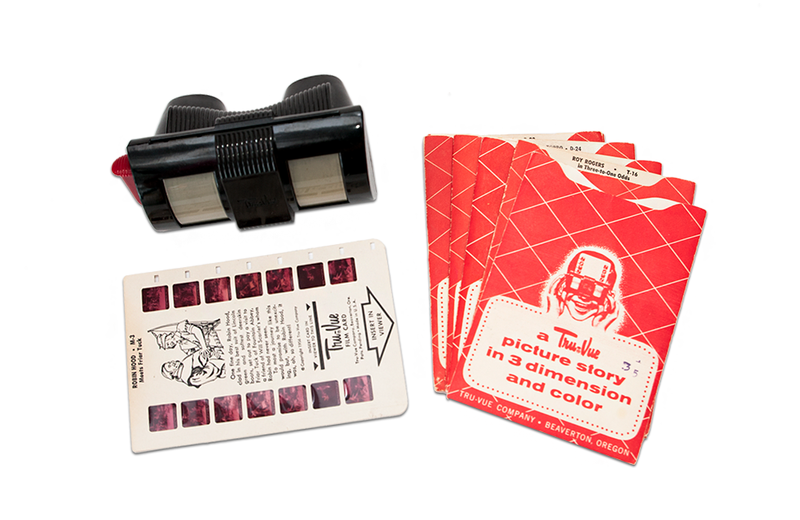 From the early 1930s through the ’60s, U.S. based Tru-Vue manufactured a series of stereoscope viewers that featured filmstrips of 14 stereo frames each. The product line bridged the time period between stereoscopic cards of the 19th century and View-Master reels, which are still in popular production today. Users pulled each Tru-Vue 35mm filmstrip through the viewer using a built-in lever. The viewers were made primarily of bakelite, a synthetic plastic created in the early 1900s, and shipped in a series of colours. When the viewer was held up to the light with a filmstrip inserted, each pair of frames appeared in three dimensions. Ads for Tru-Vue Viewers promoted the company’s character licensing agreements. As the popularity of the product grew, Tru-Vue began to produce more filmstrips (more than 400 in total), with even more being produced by third-party vendors. In the early 1950s, the company begin to dabble in coloured filmstrips. 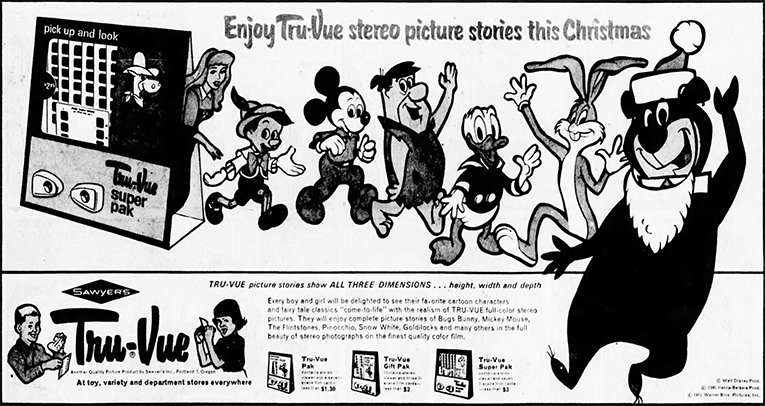 Tru-Vue’s exclusive license to use cartoon characters from Walt Disney eventually proved too appealing for Sawyer’s, the manufacturer of View-Master. Sawyer’s eventually acquired Tru-Vue, which continued to manufacture and sell Tru-Vue products into the ’60s. Standing a whopping 19” tall, Robot Commando represents one of Ideal Toy Company’s most memorable playthings for children. If you're looking to let off some steam, the Bop the Beetle game might be the release you need.